There are certain things in this life that you just can’t put a price on. For instance, love, or the sensation of snuggling a tiny kitten. A musical troupe of robotic hillbillies however is not one of these things. If you’ve got $5,000 and questionable money management skills you too could be the proud owner of an intensely creepy group of mechanical musicians. 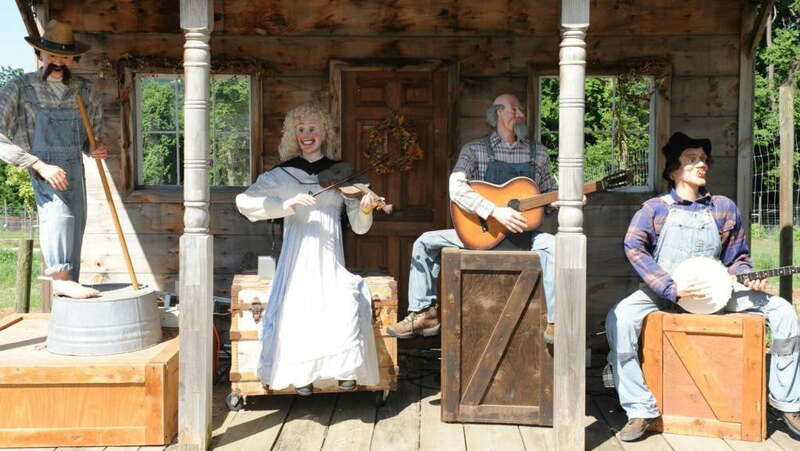 Hillbilly characters sing and move to soundtrack. Electrically powered gears and motors – no computers. Pop in the included CD and press play. Weather protector (as seen in photo), CD player, accessories, speakers, plugs, etc. all included. If you’re suddenly struck with an intense urge to blow a wad of cash on this contraption, we’ve got bad news for you: This thing is only being sold to prospective buyers who are able to pick up and transport the band from its current location in Fitchburg, Massachusetts. Though one could presumably still acquire the animatronic characters from the other side of the country, it seems the seller is pretty firm on his demand that prospective buyers make all shipping arrangements, so keep that in mind if you’re keen to place a bid. If you’re still not convinced that this is the one thing missing from your otherwise relatively hillbilly-free existence, we direct you to this collection of YouTube clips of the machines in action. We’ve embedded our favorite below, but trust us when we say that each of them offers a unique glimpse of the bafflingly eerie qualities this hillbilly band brings to the table. Detached cynicism aside, we can’t really imagine the hypothetical future owners of this thing. We suppose it could provide ironic entertainment at parties, but the sort of people who go in for ironic musical statements like this likely don’t have the discretionary cash to afford it. On the other hand, one could take the Chuck E. Cheese route and create a theme restaurant around these characters with hourly performances from the band, though we’re not convinced that children won’t run screaming at the sight of these musicians belting out their greatest hits. Then again, maybe that’s the goal here. We’re sure someone (possibly a supervillain) is hard at work on a way to terrify our kids en masse, and at only $5,000 this seems like a very cost-effective way to leave a room full of youngsters crying and wetting themselves.